Art fair participants complain, what’s new? But instead of the usual lamentations about hesitant collectors keeping their pocket books closed, this year dealers’ biggest worry was overly aggressive buyers. They just waltzed into a booth, pointed out a work and did not take no for an answer, even if the work had already been sold. This marks the cautious upswing in the art market which has been getting back up on its feet after being hit by the global financial crisis. 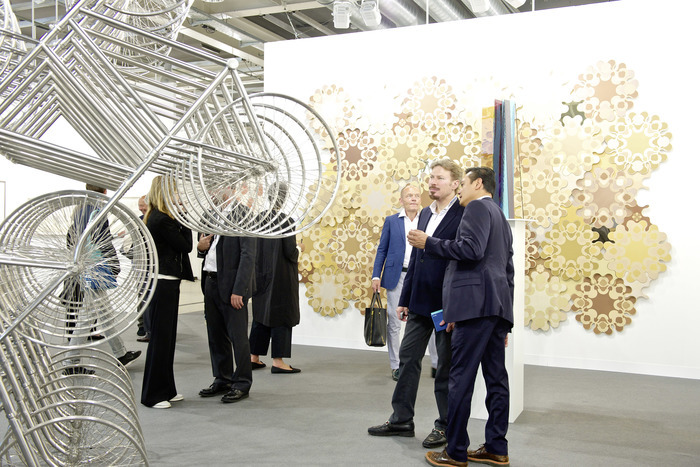 Although Art Basel—the self-proclaimed art market’s Olympic Games—typically attracts the type of high net worth individuals who have not been heavily and lastingly affected by the recession, a general sense of relief prevails at the 45th edition. Quite a few galleries had already sold out on Monday and Tuesday, the first two days of the preview. The renewed optimism shines through in the supply. Of course, for the hedge fund manager or industrialist seeking a safe investment there is still a lot to choose from. As usual, blue chip artists with proven track records in the secondary market can be found on the ground floor of Hall 1. These are works with six figure price tags at least: there’s a Warhol at Gagosian, an Yves Klein/Jean Tinguely sculpture at Hauser & Wirth, Schwitters collages at Nahmad, and lots of Picassos in the dimly lit booth of Landau. On the traditionally more adventurous second floor the offerings are extremely diverse. Art in every thinkable medium is on sale, video art being the exception. Unlike other years, there is not one or a few specific artists flooding the fair, although there are a couple of obvious stars. Ai Weiwei, whose largest retrospective ever is on show in Berlin at the moment, is represented by Galerie Urs Meile, who’s showing the same large wooden crate that is part of the show at the Martin Gropius Bau. And Neugerriemschneider has a wonderful bicycle sculpture. Longtime fair favorite Thomas Ruff pops up here and there with his pgh-series from 2013, computer manipulated photograms. These large color prints have a lot more “wall power” than Ruff’s most recent work, modestly sized negatives, which is probably why Mai 36 prefers to show the latter at the gallery in Zürich and bring the pgh-series to the fair. Photography lovers are well catered for. They can choose from a wide range varying from a large Andres Serrano at Yvon Lambert to Richard Mosse’s African rebel with AK47 doused in pink at Carlier Gebauer and an uncharacteristically romantic seascape by Richard Billington at Anthony Reynolds Gallery. After a couple of lean years painting is making a comeback, although not everything is great. The Kippenberger at Galerie Gisela Capitain is not particularly attractive and the Sasnals at Foksal are not as exciting as expected, but David Schnell’s large-scale landscapes in hallucinatory greens and oranges are mesmerizing (Eigen + Art) and Studer and van den Berg’s painting of an airport lounge is simply a really good work (Krupp). 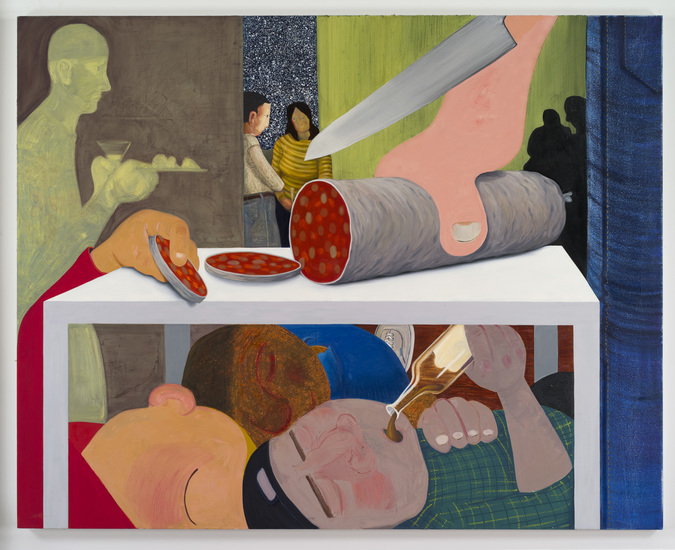 The biggest discovery of the year is probably Nicole Eisenman, brought by Susanne Vielmetter Los Angeles Projects in the Feature section. Eisenman could be the new Philip Guston, infusing boldly painted scenes of cigarettes smoked, sausages cut, and bottles emptied with a pinch of surrealism. All works priced around $20,000 were sold in no time. Collectors looking for something less conventional than a regular canvas could head for Cherry and Martin, where T. Kelly Mason combines painting and collages with light boxes. Victoria Miro has a wonderful, almost pocketsize Sarah Sze sculpture on sale, much smaller than the huge installations the artist is known for but with all the subtlety and complexity one could ask for. And the new William Kentridge film at Marian Goodman also qualifies as top of the line. As is appropriate since this section was specifically conceived as a kind of showcase, the small but sweet Statements section offers the—commercially—truly daring works. Given the experimental nature of some of the art the price level tends to be lower than at the rest of the fair. The Tino Seghal-inspired 5-channel audio installation by Christian Falsnaes (PSM)—two actors and members from the audience following instructions to point, hug, whoop—costs €18,000 for an edition of three. The installation Love – Poem by Trisha Baga (Société) is a downright steal at €12,000. This unique piece consists of a soundscape and a 3D-film projected on a wall installation. But the most unusual work by far is by David Brooks (American Contemporary). Brooks hoisted five fish tanks, containing previously undocumented catfish from the Amazon, onto bleachers. The €60,000 work questions the relationship between animal and man, viewer and object being watched, and above all the difference between the nature of art and the art of nature. Whoever, after the hubbub of the market, prefers a more subdued atmosphere to enjoy art in can head for Unlimited. Here seventy-eight works by artists represented at the fair are shown in a museum-like setting. The list of names is impressive, the intended impression monumental. This does not imply the show is without weak spots. Kara Walker’s wall painting of racial stereotypes in silhouette, a theme reworked by Walker over and over, feels tired. Claudio Moser’s rather tame presentation looks like it could have been in the Features section of the fair. And Ann Veronica Janssens has made far better work than the green lights forming a star she’s now showing here. And what’s the reason for showing old works by Bruce Nauman (a 1991 video), Mario Merz (a 1995 igloo) and Carl André (his famous floor work from 1982) at this showcase? Sure, they are iconic works of art but their presentation lacks urgency and any obvious relevance. 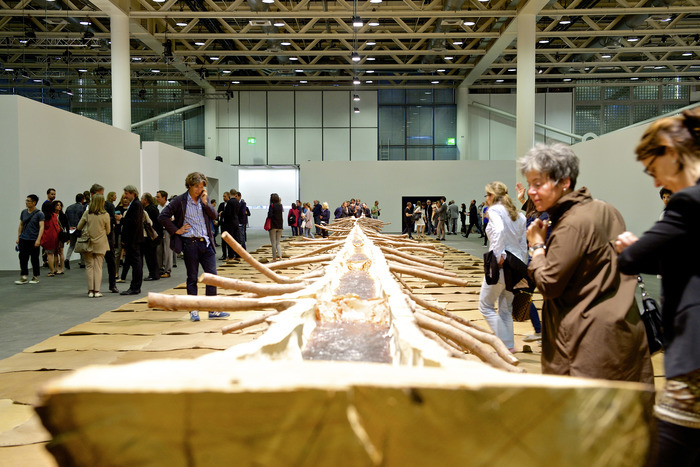 The only representative of the old guard this does not apply to is Arte Povera great Giuseppe Penone. His Matrice di linfa (2008), halved tree trunks on cowhides spreading across almost the full width of the hall, is majestic. Some oversized installations qualify as immediate attention grabbers. 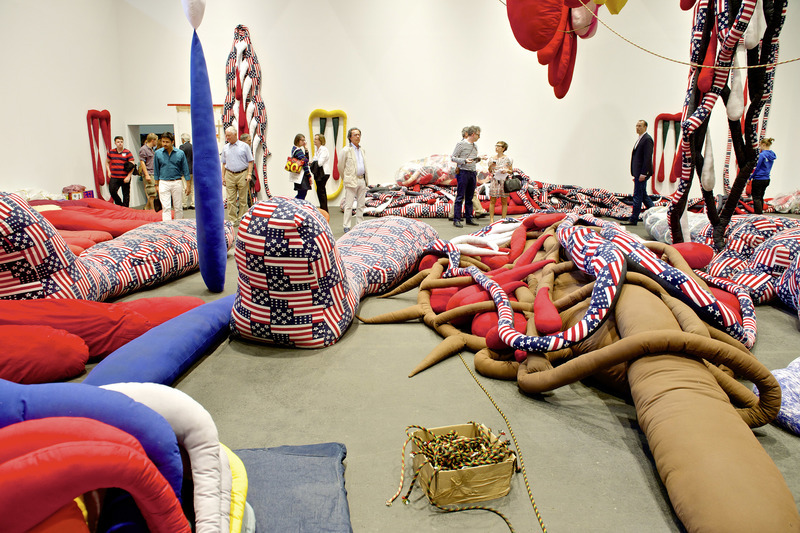 Sterling Ruby’s Soft Work looks like a warehouse storing mummies wrapped in stars-and-stripes cloth. In a similarly crowded set-up Pascale Marthine Tayou lures the viewer into a labyrinth constructed from cupboards containing tourist trinkets, household goods and groceries. Neons, video projections, and audio changing at every turn bring to life the chaos of Yaoundé, the artist’s hometown. As usual the bulk of Unlimited consists of time-based work, presented in cave-like booths which in a few cases have been placed unfortunately close together so sound from one work seeps into another. What’s on offer is great, though. It ranges from Guido van der Werve’s wonderfully scored, cerebral celebration of endurance to Ming Wong’s three-screen exploration of gender archetypes in Japanese cinema. Ryan Gander’s 68 second Imagineering mimics commercial advertisement, while Christian Marclay’s Shake Rattle and Roll (Fluxmix) is a dizzying sixteen-monitor installation and Harun Farocki explores thirty years of computer graphics history with lots of machinegun fire and explosions. Unlimited is very much about watching the flickering in the dark. But when moving back to the main entrance one is confronted with the largest and probably best three-dimensional work on show. 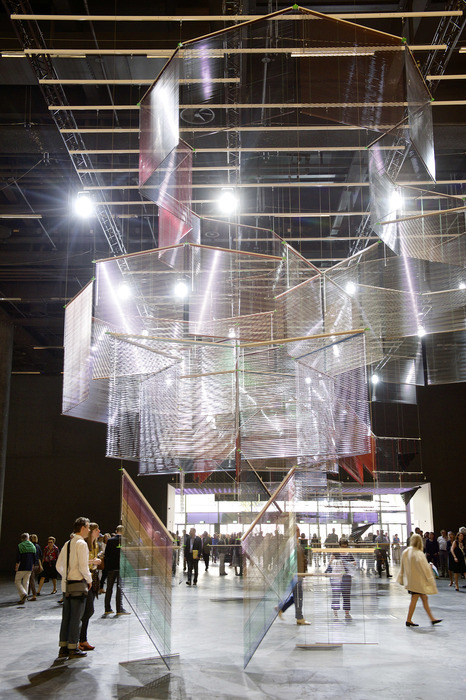 At the 2009 Venice Bienniale Haegue Yang impressed visitors of the Korean pavilion with her hanging sculptures made from colorful blinds. But Accommodating the Epic Dispersion – On non-cathartic Volume of Dispersion (2012) easily tops the earlier work. It’s a complex play of lines. Depending on perspective and light the sculpture is diffuse or rigidly closed. It seems to move and breathe. And still it’s only blinds.